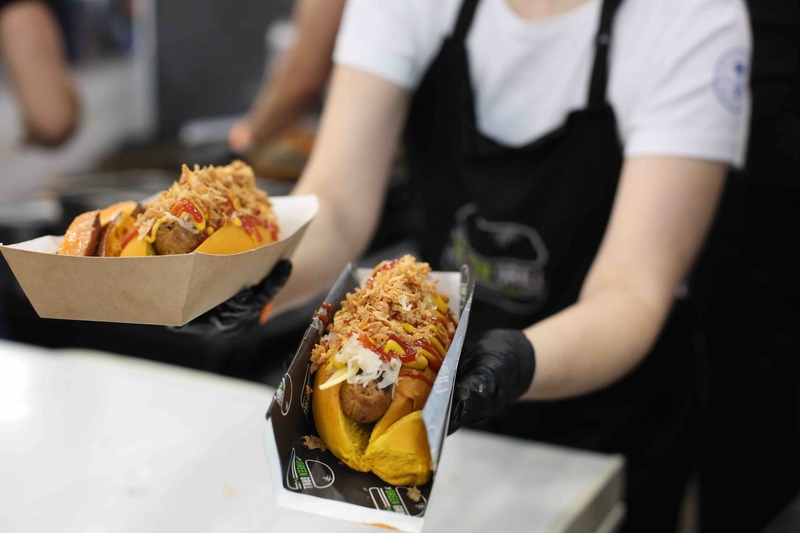 VegfestUK celebrated its 6th annual vegan festival at Olympia London with a bang, welcoming around 14,500 attendees, 280 exhibition stands and just over 100 talks and presentations over the weekend October 27-28 across 4 exhibition halls at one of the nation’s highest-profile exhibition centres. Utilising Level 1 of Olympia West as well as all 3 levels of Olympia Central, this year’s event spanned bigger floor space and included more features and exhibitors than ever before, with the aim of satisfying the rising demand from businesses looking to exhibit as well as visitors with all kinds of interests. The Olympia Conference Centre, which has been a regular feature at VegfestUK London and offering top-notch conference facilities to visitors since 2015, played host to a packed programme of talks and panels based on a large selection of topics surrounding Health, Environment, Radical Veganism and Justice. 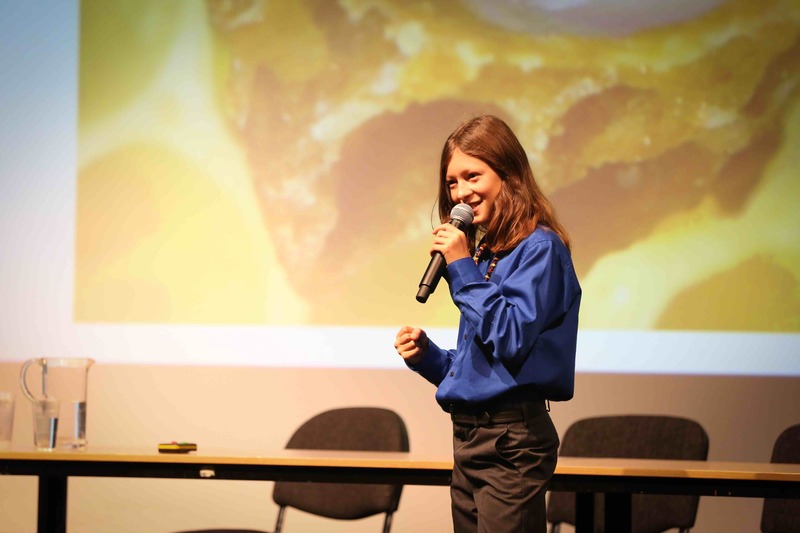 They were flanked by a Cinema showing a quintet of thought-provoking documentaries on a vegan way of life, a Kids Area with accessible and fun cookery classes for kids, in addition to a 450-seater Auditorium welcoming keynote speeches, a star quiz, a celebrity panel, a discussion on (vegan) chocolate, plus 2 bodybuliding competitions on Sunday. A new exhibition hall of Olympia Central Level 2 was added to this year’s floor plan to accommodate extra stalls and visitors. With a wellbeing theme uniting all the features in this hall, visitors were treated to yoga, tai chi and qi gong classes, talks on Permaculture Fitness and Raw Plant-Based Lifestyles, Chillout Music, Kids Yoga, alongside Market Stalls and Free Gifts. 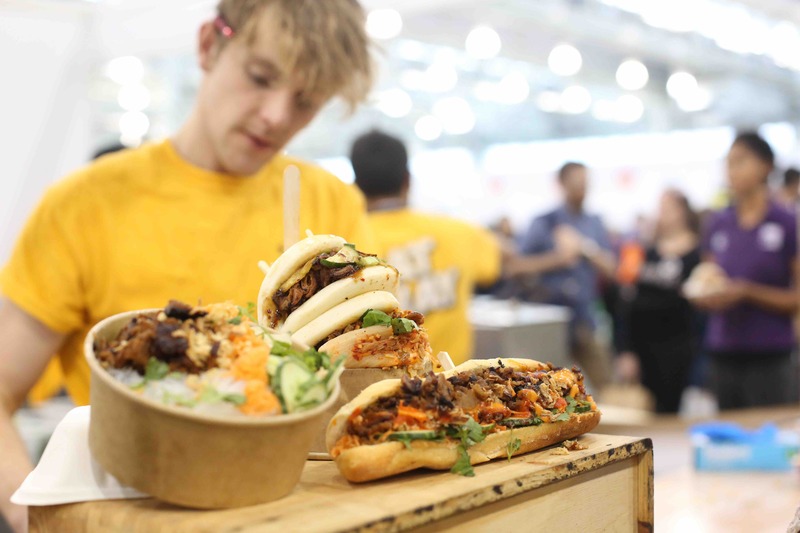 The tried and tested Vegfest mix of caterers, shopping, cookery demos and comedy remained popular with visitors on the lower exhibition floor. Caterers drew influences from a rich diversity of global cuisines including Ethiopian, Greek, Indian, Chinese, Turkish, Caribbean, Jamaican, as well as plant-based varieties of British favourites such as beer, hot dog, pizzas, burgers, wraps, nachos, and mac n’ cheese, alongside freshly produced juices, smoothies, sushis and more. Visitors also got the chance to learn about veganism from an art exhibition with a series of evocative art posters and exhibits kindly put together by the Art of Compassion Project, who was also raising money for Hugletts Wood Farm Animal Sanctuary. 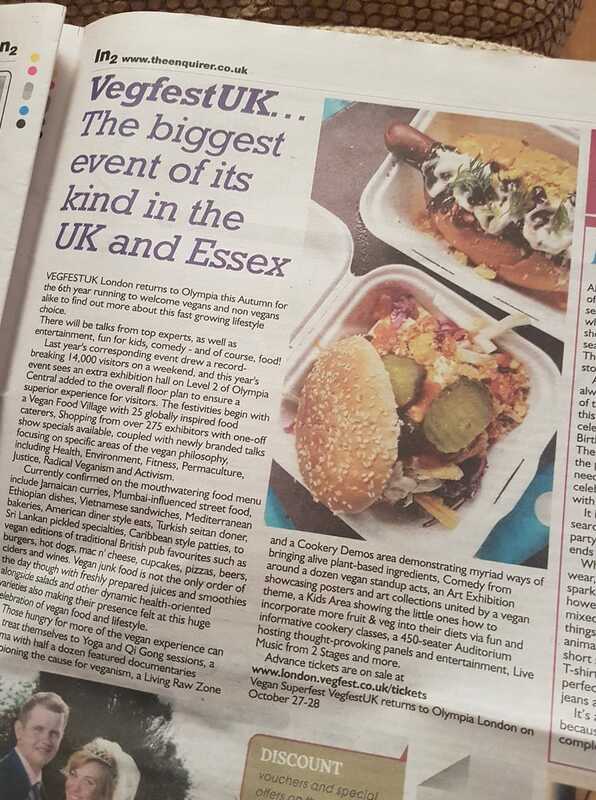 VegfestUK was mentioned pre-event in a number of media stories by the likes of the Daily Mail, London Post, Londonist, Britain Magazine, Natural Products, Absolute Magazine, Amor Magazine, West London Living, House of Coco, The Enquirer, with many more to come – for full media coverage click here. We’re obviously thrilled to see how well received our flagship event remains after 5 fantastic years at the same venue. Each of these big shows takes at least a whole year of planning and preparation, and of course it’s hugely gratifying to see the hard work paying dividends. 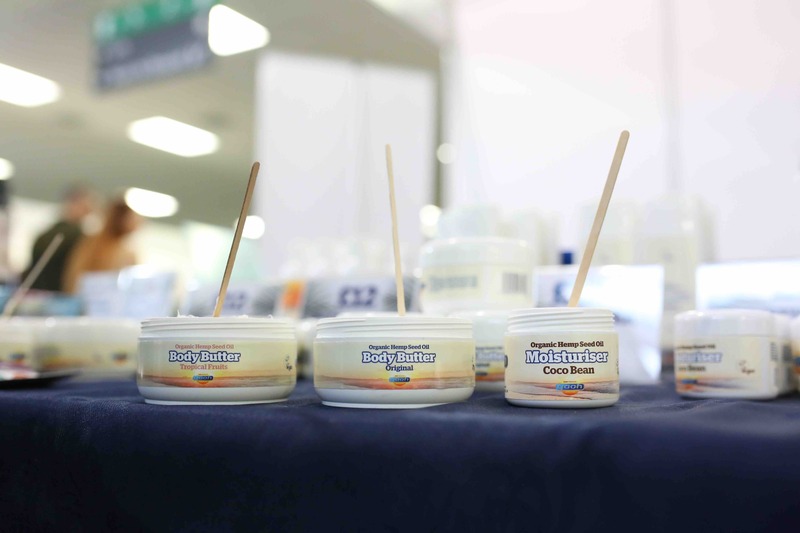 In particular, given the rising availability in vegan products mainstream and numerous other options in terms of vegan events, it’s become ever more challenging to put together a successful vegan festival which meets the expectations of businesses as well as consumers, and so seeing the numbers on the weekend as well as the extensive media coverage beforehand adds to the satisfaction. Big thanks to everyone who came along, and huge gratitude to all our sponsors, exhibitors, guests, volunteers, venue staff, security team, our regular crew and everyone else who has contributed to such a marvellous weekend. VegfestUK moves onto their next show at the Brighton Centre on March 23rd 24th 2019, with the show website going live on November 1st 2018. VegfestUK London will also be returning to Olympia London for the 7th year running on October 26th 27th 2019, and the full show website going live in mid-January 2019.